Cognos vs Business Objects vs Crystal Reports | Who Wins in 2019? Cognos vs Business Objects vs Crystal Reports: Who Wins in 2019? Companies have many choices in how they want to pursue building business intelligence resources. There’s a broad consensus that many businesses simply can’t afford to ignore this aspect of enterprise any longer. With so many good tools and technologies on hand, companies that aren’t taking a magnifying glass to things like product data, customer relationships and sales numbers are simply missing out. Here we compare three popular BI tools: Cognos vs Business Objects vs Crystal Reports. In a comparison of SAP Business Objects vs IBM Cognos analytics, both application suites are popular for conducting vital business intelligence research. Often included in these considerations/discussions is SAP Crystal Reports, so we’ll explain how that fits in as well. To better understand the advantages of these three BI platforms, it is important to examine their top features. IBM built Cognos as a platform for “smarter self-service” and promotes its ability to let users personalize results and create modern dashboards from anywhere, over the cloud. In addition to standard visualization-building features, Cognos BI takes report creation a step further with recommendations. As users choose data to visualize, the system makes suggestions for which type of graph, map or image will best display the information. BusinessObjects is promoted by SAP as performing “agile visualizations” to really make data presentable and digestible to an audience. The software’s report building feature accesses SQL queries to provide needed data. Going beyond typical visualization elements (images, texts, charts, etc. ), BusinessObjects includes features that can be used for infographic creation within reports. There’s also the BusinessObjects Design Studio for creating multi-dimensional dashboards with other tools like SAP NetWeaver. Rich formatting tools allow for detailed customization options with Crystal Reports. The program can use simple and complex data sources to sort, analyze and display reporting in the most efficient format for a specific recipient. If your company focuses heavily on generating custom reports and has complex data correlation needs, Crystal Reports can be a good choice. An additional benefit is the program’s ability to create reports in 28 different languages. When comparing Crystal Reports vs Business Objects vs Cognos, the intuitiveness of the IBM Cognos BI visualization platform places the software above its SAP competitors for this feature. 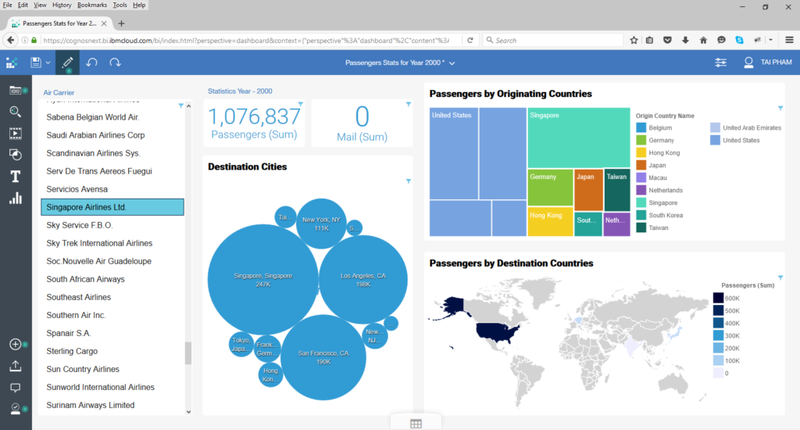 Data visualization features from IBM Cognos Analytics. Through Cognos Analytics, IBM provides businesses with a solution for data comparison and benchmarking, predictive analytics, trend forecasting, social media analytics, and mapping functionalities. The software is an AI machine learning tool that focuses on uncovering unseen trends and insights. Automated BI features ensure little need for initial data preparation. Additional analytics abilities include Cognos Content Analytics, which manages the analysis of unstructured data. IBM Cognos Statistics allows for statistical reporting. SAP BusinessObjects has a comprehensive solution that analyzes past data and forecasts future possibilities to provide context for the current state of your business. This all-encompassing approach to data analysis provides in-depth insights and, by association, more informed decision-making. Specific analytical capabilities include updates in real time and self-service functionality. With these features, all members of an organization can access accurate, insightful data portraits. As the name states, Crystal Reports is an enterprise reporting system, rather than a standard business intelligence tool. However, the more streamlined functionality of the software does not compromise its analytics abilities. The program brings insights forward through filtering, organizational tools and search systems. When comparing Cognos vs. Business Objects and Crystal Reports, SAP BusinessObjects has the most advanced analytics capabilities of these three systems. Data analysis via SAP BusinessObjects. Cognos BI centers information in an OLAP space where users can drill into data to explore layers, uncovering origins of problems and potential solutions. Supplementing the standard OLAP features, IBM Cognos Analysis Studio offers additional data exploration capabilities and time series analysis. With SAP BusinessObjects, analysts can tap into OLAP data cubes. Through drill-down analysis, calculation and data modeling, information stored in cube hierarchies is brought to the forefront. Beyond the analysis of layers, BusinessObjects users can also pull definitive data points for further investigation. Powerful reporting tools with drill-down capabilities reveal key business insights in OLAP cube reports created in SAP Crystal Reports. Users can connect to OLAP sources through the software, enabling data layer exploration. Looking at Crystal Reports, Business Objects, Cognos — all three systems have standard OLAP capabilities and are equal in this category. Users of IBM Cognos Analytics can convert reports into HTML, XML, PDF, CSV and Microsoft Excel files. Extensions provide version control ability. SAP BusinessObjects streamlines report sharing with its supported formats. Reports can be exported as a PDF, text file, Excel spreadsheet and more. The program includes a Lifecycle Management Tool to manage version control. Using these features, report creators can distribute data visualizations throughout their organizations via web-based and mobile platforms. With Crystal Reports, information is available offline or online in a variety of formats. Users can share their creations through the web, mobile, email and, much like BusinessObjects, Microsoft Office. When considering Business Objects, Crystal Reports vs Cognos, all have baseline document management systems, resulting in a tie for this feature. IBM offers several features intended to guide businesses through the implementation and continued use of Cognos BI. These features make up the Cognos Solutions Implementation Methodology (CSIM), a suite that analyzes the current architecture of your business and aids in the deployment process. The system includes financial and compliance management features that monitor measures such as revenue and risk assessment. Cognos BI integrates with IBM fraud protection tools including Anti-Fraud, Waste & Abuse, CFO Performance Insight and Next-Best Action. Consulting services are provided by outside sources. As BusinessObjects and Crystal Reports are both SAP products, the tools share the SAP decision services features. SAP has a comprehensive decision service platform focused on educating, supporting and protecting its users. SAP’s help resources provide answers on technical inquiries and advice to guide decision-making. More specifically, financial tools through SAP manage financial data and aid in strategy development. SAP Governance, Risk and Compliance tools manage fraud risk and compliance management. In the same vein, data security is built-in to the system. The learning materials offer knowledge on the software and business intelligence in general. IBM Cognos Analytics’ decision services are the most comprehensive when comparing Cognos, Business Objects or Cognos vs Crystal Reports. IBM Cognos BI has some built-in integration abilities for certain external products, e.g. ERP software from Oracle or CRM tools like Salesforce. However, some programs require additional development through the IBM Cognos BI Software Development Kit or IBM Cognos Portal Services. SAP BusinessObjects is able to seamlessly integrate with your company’s existing ERP tools, CRM systems and other software. Another major component of BusinessObjects is SAP BusinessObjects edition for Microsoft Office which gives users, in SAP’s words, “the power to dig deeper into your business data from within the familiar Microsoft Office environment.” Having a specific Office-compatible tool allows for very specific kinds of raw data gathering that might otherwise be a lot harder or require expensive, agonizing manual data entry. Since SAP owns both BusinessObjects and Crystal Reports, there is full compatibility with formatted reports in up to 28 languages. As mentioned, Crystal Reports easily integrates with fellow SAP program BusinessObjects, as well as some of the vendor’s other offerings. Crystal Reports also shares Microsoft Office integration abilities with BusinessObjects. Additionally, the software integrates with Flash to assist in report building. When comparing Crystal, Business Objects vs business intelligence of the Cognos solution, each of these business intelligence tools has different integration abilities but are on a level playing field for this feature. Data drivers embedded in IBM Cognos Analytics access Hadoop, Hive, HBase and Cassandra bases. With Natural Language processing, the system assists in selecting the best data source for your query. Furthermore, the software reduces data preparation time with automated modeling. BusinessObjects has the ability to connect to a multitude of Big Data sources — Apache Hadoop, Amazon Elastic, HBase and Cassandra integration is offered. Additionally, users can access the SAP databases Business Warehouse and SAP HANA. In Crystal Reports, connections to broad data sources allow ad-hoc data mapping and report creation. The software advertises its ability to connect to “virtually any data source,” with listed possibilities including Apache Hadoop, Salesforce and a number of sources in the IBM, Microsoft and Oracle families, among others. When comparing Cognos business intelligence vs Business Objects / Crystal Reports, the extensive Big Data integration abilities of SAP Crystal Reports surpasses that of the other two. View of an SAP Crystal Reports dashboard. The software has the top Big Data integration abilities compared to SAP BusinessObjects and IBM Cognos Analytics. Which are “nice to have”? Which platform is best for your company’s size? How complex is the corresponding backend administration, product tech support and overall ease of use? How much time do you and your colleagues have to devote to reporting? All of these important factors will lead you to the right BI platform for your business. For example, if you determine you have limited time for reporting, you might prefer a platform with automatic reporting and intuitive input features. If your needs are more complex and onboarding time is less of a concern, a more user-driven platform might be ideal. 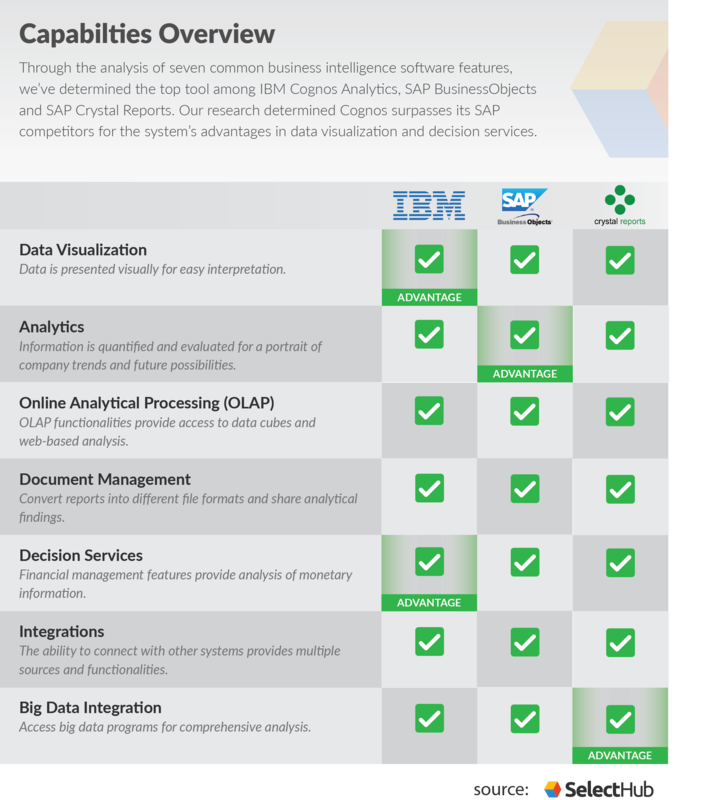 When it comes to BusinessObjects vs Crystal vs Cognos BI platforms, the discrepancies are as important as what they share in common, and having multiple options on the market allows a business to find the perfect fit for their specific needs.In the evaluation of the aforementioned features, IBM Cognos Analytics is the most advantageous tool compared to SAP BusinessObjects and Crystal Reports. The software’s data visualization tools and decision services outweigh the other programs’ benefits. Which business intelligence software features are most important to your organization? Which of these three systems satisfies the needs of your business? Answer in the comments!